Over 140km in length, the Tuross river flows north, east and northeast generally. Rising in the eastern slopes of Kybeyan range as apart of the Great Dividing Range, Tuross catchment has 13 tributaries. 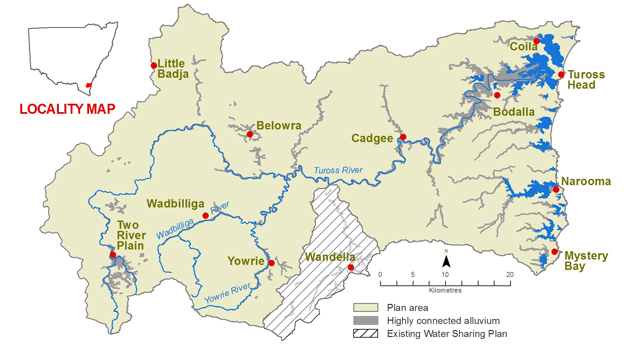 The Tuross catchment is located on the New South Wales south coast with an area of 2,180km2. Narooma, Tuross Heads and Bodalla. The Wandella Creek is a tributary of the Tuross River. View real-time data from the Tuross catchment on this website. Most of the rivers and creeks in the Tuross River Basin are unregulated, with no major storages to capture and control flows. Eurobodalla Shire Council, forestry, agriculture and oyster farming. Since there are no major storages to capture and control flows, most water users rely on natural flows or small structures, such as weirs for their water supplies. As in most unregulated rivers, flows are mostly affected during relatively dry times, when water is low and demand is high. The management of lands along river and creek banks is an important issue that can affect water flow and quality. 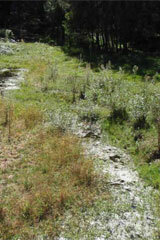 For example, cattle grazing can damage sensitive riverbank vegetation resulting in erosion. Development along the coastal fringe can alter natural waterways and increase water pollution. Under the Water Management Act 2000 all water sharing plans are required to have performance indicators to assess whether the plans have been effective in meeting their objectives. The Environmental flow response and socio-economic monitoring. South Coast - progress report 2010 ((PDF 4.3 MB)) summarises activities undertaken in the previous water year and provides an interim assessment of outcomes from the investigations.